I’m late again. Sorry but I have been silly busy with sewing and also had a week away on holiday (vacation for you US readers). I can usually expect an upswing in business when the weather changes significantly for any length of time – but it only changed a couple of days before I was due to go on holiday and I was already pretty swamped so I just kept my head down. I’m not going to complain – many people would be glad of my current work load. Anyway, MMM went reasonably well, although I have noticed I repeated some clothes more than I expected (we all have favourites – don’t we?). 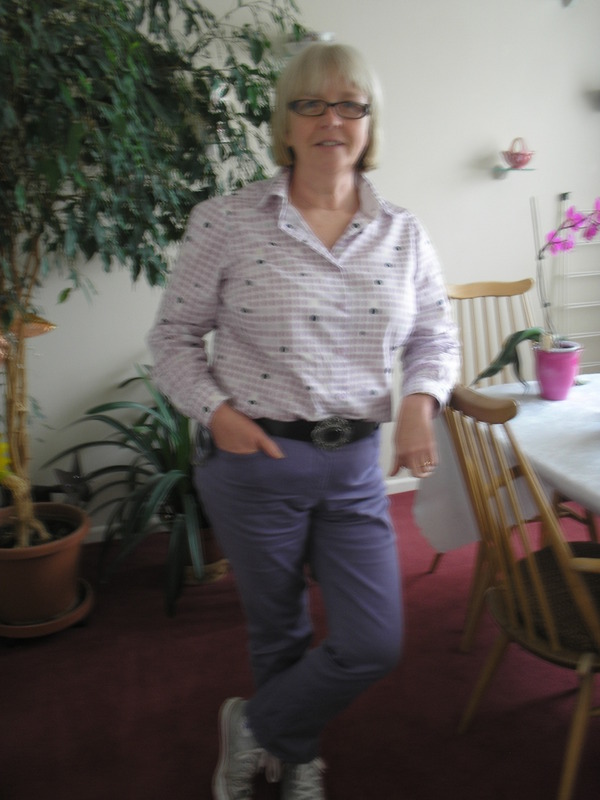 I was good at making sure that I wore at least one self made item every day but I was not so good at getting photographs – perhaps if Zoe does it again I will be better? 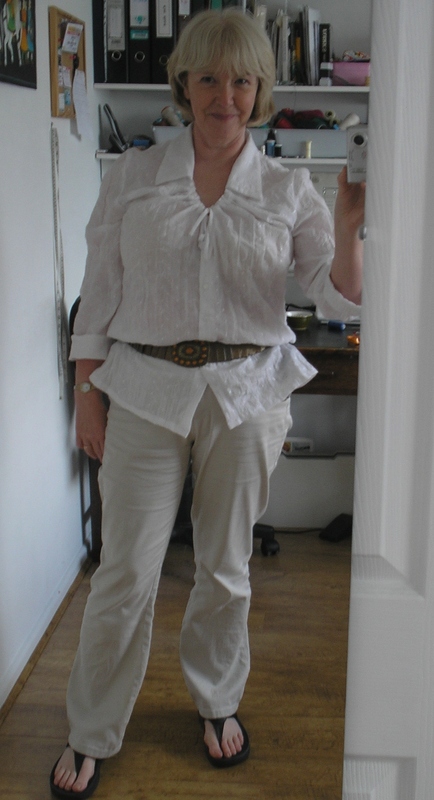 I made more effort to get to the back of the wardrobe, and bottom of drawers, for the garments that have been forgotten and found a couple of tops/blouses that hadn’t been worn in an age,anda skirt that I thought I had got rid of ages ago that was just perfect for the unusually warm weather we had just before my trip away. I think I can claim to have met this years challenge completely. Yay me. 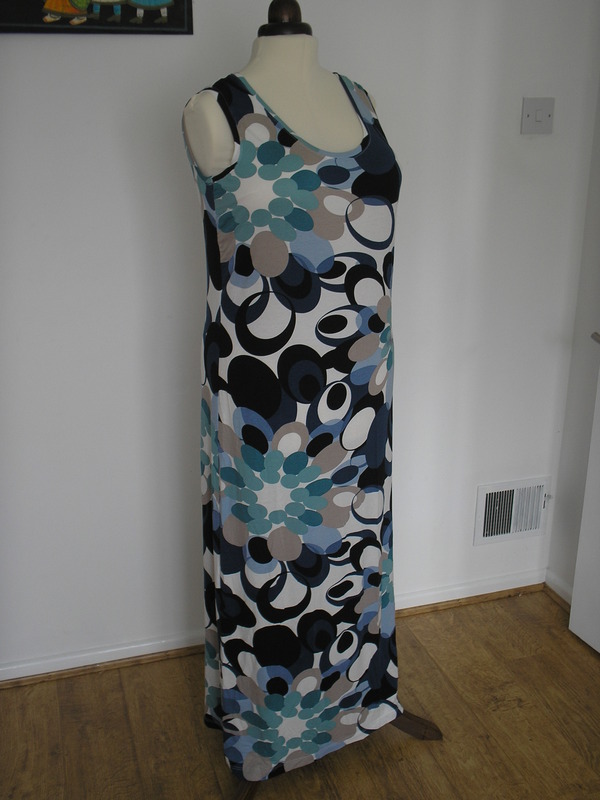 I was determined to have at least one new garment before I went to Portugal and managed to make a maxi-dress, which was self drafted but very similar to McCalls 6559. 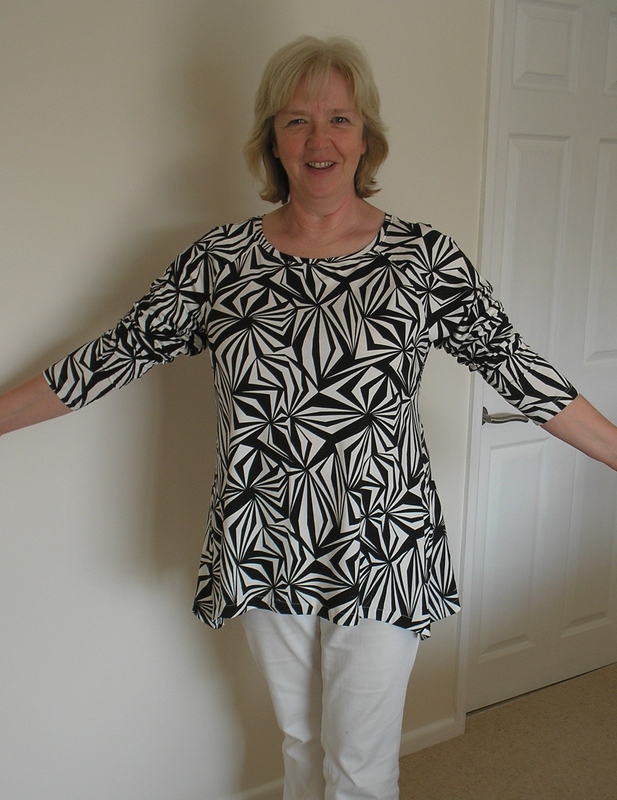 I made it in one of the wonderful viscose jerseys that I have in stock for this summer – I had been looking for an excuse to use one of these! I used 537, the abstract flowers, eventually going with the blue colour but it was hard to choose as I loved both colourways. I did almost all the sewing on my overlocker, using the 4 thread option to give the seam strength, and only using my sewing machine to anchor the neck bindings into place. 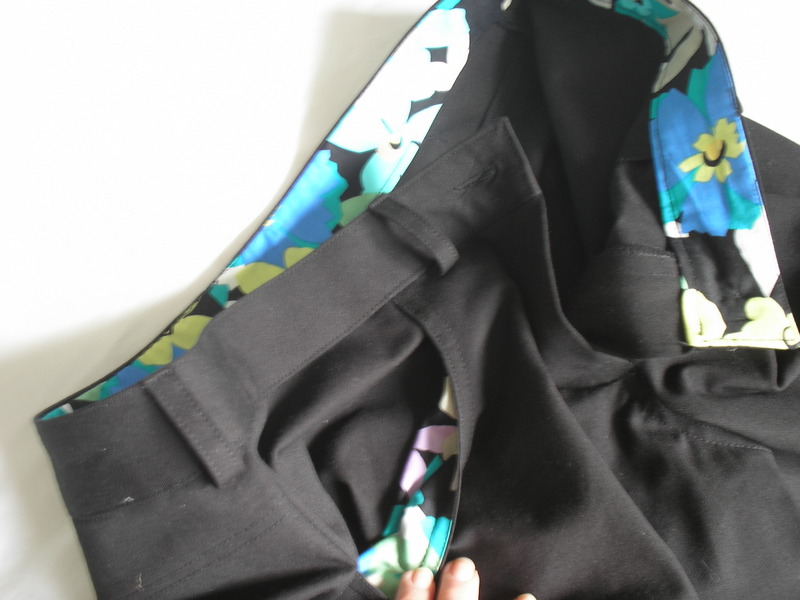 Rather than sew a dart into the side seam I ‘curved’ the dart area of the seam on the front and eased it onto the dress back – stretching it to fit the area that the dart would have been sewn into. It looks much nicer without a dart, and proved that even my 5cm dart would ease into the side fairly easily. This was just the quick project I needed after a whole stack of work for clients. I wore it several times on holiday and it was very cool and comfortable. I think I need another of these …. time to cut a length of green for me now I think! I have cut a pattern based on a jacket brought to me by a client which I really liked and I think that it will become the starting point of the ASG Summer 6PAC. I have been planning the 6 linked garments but not actually doing any sewing yet. I think it’s time to get the fabrics out and make a start. Wish me luck! Oh boy have I been busy. Not just sewing – the rain eased off just long enough so that i couldn’t avoid having to cut the grass. Darn. And then someone squished my car a bit in a car park – fortunately I was sitting in it at the time so I nobbled them! Sorting out the repairs took some time too. And there has been sewing. 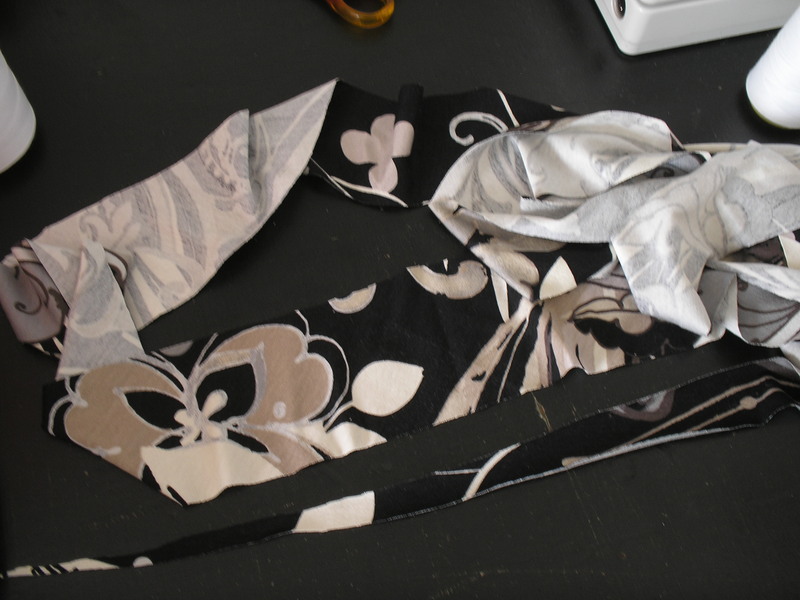 And then a bit more sewing – and nothing for me. Boo hoo. Anyway, MMM. I am still pathetically short of good photographs – but since I see that Carolyn takes her own (magnificent) photographs I really must stop complaining about the managements efforts and get on with it myself! Bessie has been a willing volunteer so some garments are shown on her. In my last post I confessed to being in my PJs already – but since it was my birthday I was allowed to do what I wanted. So there. On the 9th I was invited to lunch with the previous ‘Material Lady’. Due to a ‘scabby knee’ , legacy of my carelessness, I couldn’t wear a skirt so I wore the self drafted shirtdress which was SAM2 and a pair of black leggings and black boots. Good lunch – good conversation – comfy clothing. Great day. Payment for a day out was a full days sewing. Fittings, visits, the works. 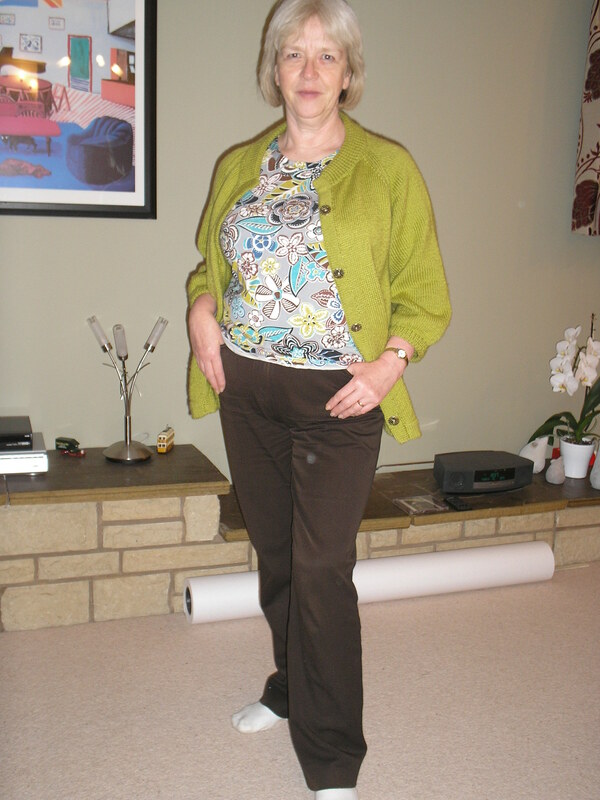 All achieved wearing a self drafted t-shirt (another of my ‘shy retiring’ pieces) and the black cardigan in the same pattern as last weeks green. Perfect clothing for crawling the floor and all the other undignified things a dressmaker is required to do. We had friends round for drinks on friday evening – nothing ‘posh’ so I wore my happy top and brought the black leggings out again. I think this is the garment I like the most of anything I have made recently – so much so that it is starting to fade in the wash. Oh dear. A good night was had by all. More conversation, drink drunk, and bed far too late. Which didn’t bode well for saturday morning…. …..when the garden simply had to have some attention. The rain held off long enough to cut the grass and tidy a bit generally. But I still wont show you any pictures – I am no gardener. All the rubbish was taken to the tip and I got the Patrones black gardening jeans suitably filthy. I feel a bit sad for these jeans – it’s not their fault I have changed shape so they don’t fit any more. Sunday was spent just reading the papers, catching up on house work, and generally trying not to do very much. 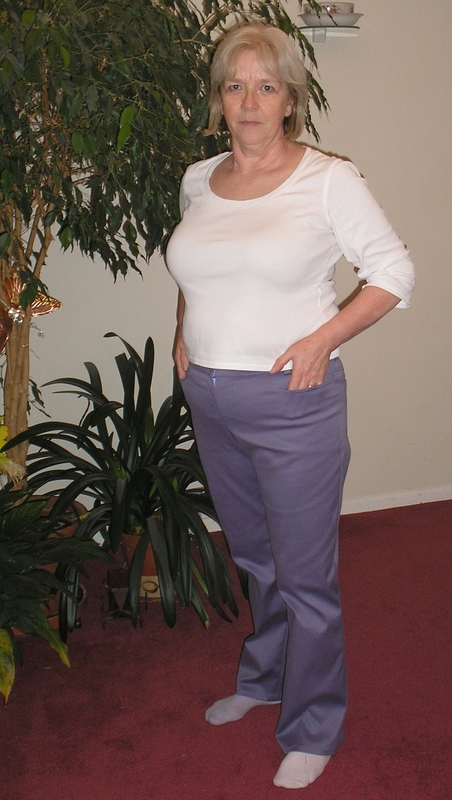 Wearing purchased jeans and T-shirt. Bad Kim! 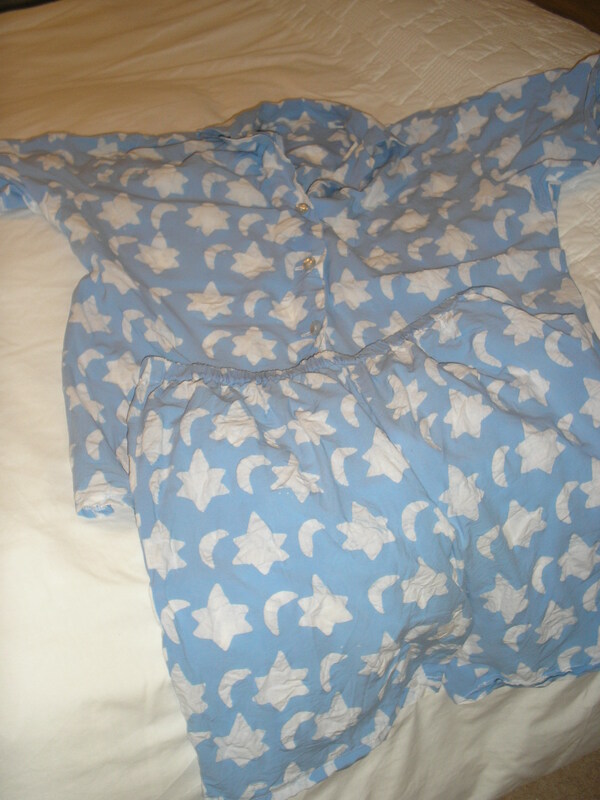 Just as well I wore my moon and stars PJs to bed. Monday 14th was another day doing odd jobs, but I was to go out in the afternoon. 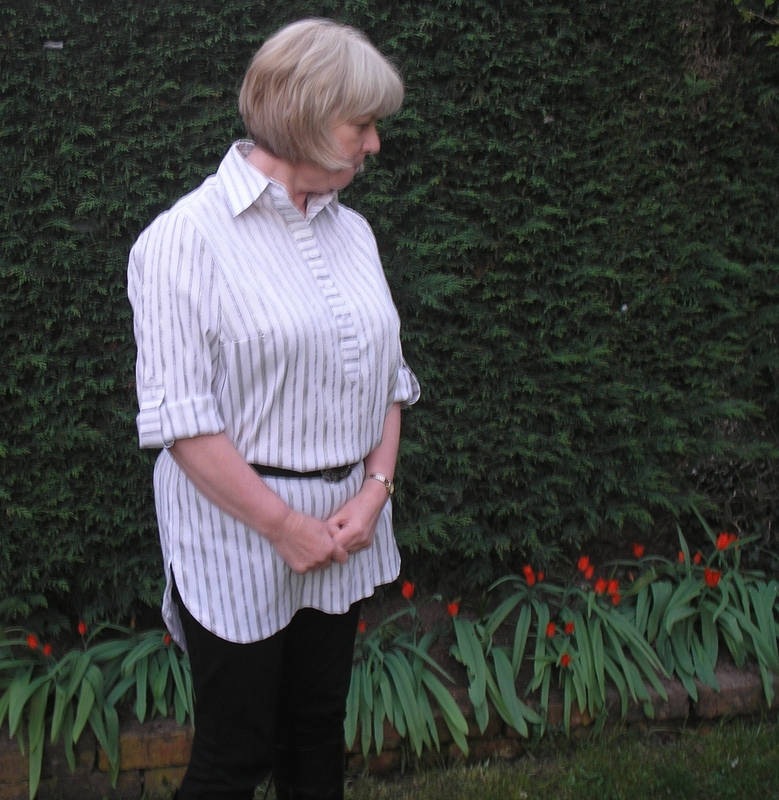 Wearing a Burda shirt in a white crinkle broderie anglais cotton I found lurking near the back of the wardrobe – how did that happen! 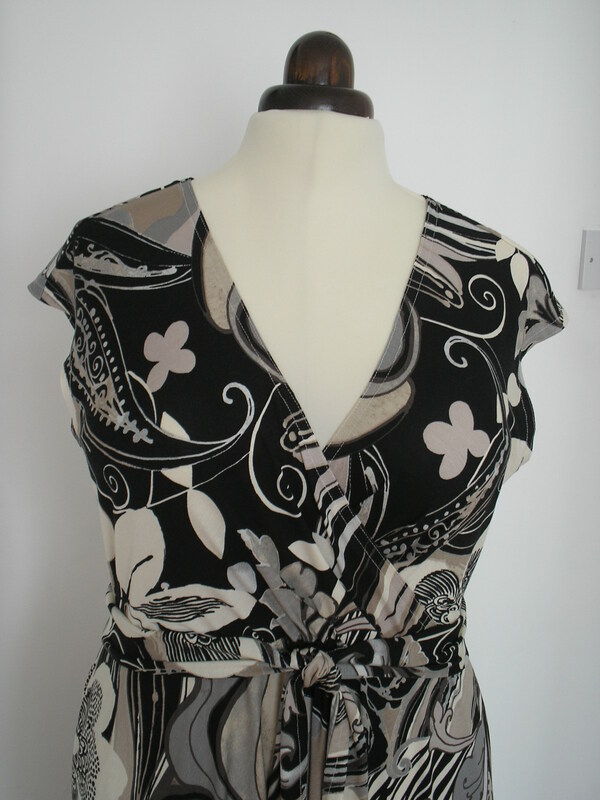 It came from Burda 3/2009 and is style 106. A real gem. And I have another in a different fabric – blue striped cotton. Sadly the day was a little spoiled by someone with a car bigger than their ability to drive it. but the shirt was good! Another week completed and I can still hold my head up and say I am fulfilling my promise to the challenge. Almost half way done now! Sewing for myself has slid off the radar so I am about to re-instate the 30 minutes for me at the end of each days work. Look out for the start of the next (very late!) SAM! I know I was probably over optimistic when I bought the last pile of patterns but I really would like to get all of them made sometime soon. A friend wanted to try Vogue 1027 too so it was a good excuse to start with this! (I’m so easily led:( ). The fabric I chose was another that I really have been itching to get at. 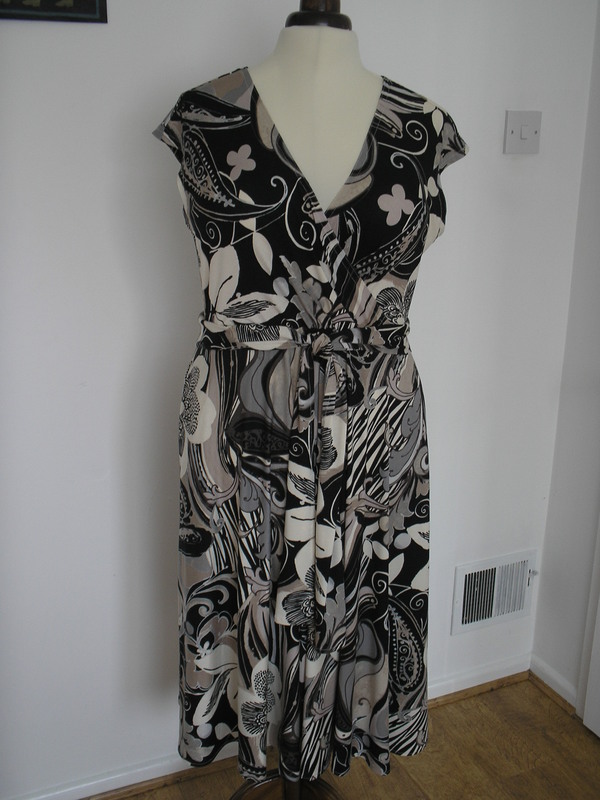 It is a lovely viscose/elastane jersey (531 – Stone). I was shocked when a friend told me she avoided viscose and rayon because ‘she didn’t like man-made fabrics’. Whilst I agree that some of the ‘man-mades’ from the petrochemical end of the market can feel uncomfortable occasionally (though by no means all of them) viscose is made from cellulose fibres – much the same as linen – so I find them very cool and comfortable to wear. And not a bad fabric to work with either – not slippy and difficult! 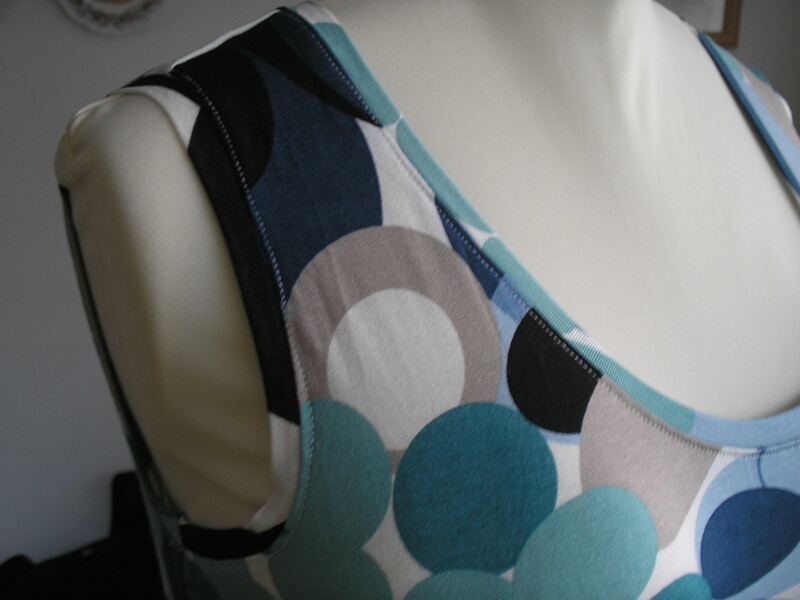 No-one should be scared of sewing jersey fabric – it can be very rewarding to work with. take your time and its easy. The most difficult part of this pattern was getting enough space to cut the skirt out – the half circle pattern piece takes a lot of space! Everything fitted together exactly as it should – and although I am fairly ‘blessed’ in the chest department I didn’t do a FBA since my friend was trying this dress too and it fits just fine. I did put clear elastic round the neckline, just to give a little extra support, but didn’t shorten it too much because I didn’t want the neckline tightened at all. The ties on the waistline are neatened all round, and although the pattern instructions were good I thought that it would be easier to get a good finish by working a mitre – not quite to the edge so it was still possible to double turn to thoroughly neaten the corner. This worked really well and prevented the fabric from shuffling around in that difficult corner. Not easy to describe verbally – I might try to show this in pictures another time. The dress was left on Bessie overnight to let the hem fall into place, as it was almost all off grain, before cutting it straight. I used my floor standing hem measure and left the dress on Bessie while I measured around the hem from the shortest point on the skirt. I was quite surprised at how much the hem had dropped. You can see from the picture of trimmings the range I had to take off. I love the dress now it is finished – I suspect it will be a real go-to dress on warm days (you can tell I am an optimist given the way April has been in the UK!) and is a real packing dream so it will be going on holiday. I just hope I get it back from my friend as she has borrowed it to try! P.S. Me-Made-May is going well – at least one (and usually more) garment every day so far. Photography is less good….. I spotted that Zoe was encouraging everyone to have another ‘Me-made’ month where we all pledge to wear as many self-made garments as we can. I admit I failed miserably at ‘me made March 2011′. Miserably. However – ever the optimist I have signed up for this challenge (just a challenge – not a competition) with every intention of honouring my pledge. ‘I, Kim, of themateriallady@wordpress.com , sign up as a participant of Me-Made-May ’12. 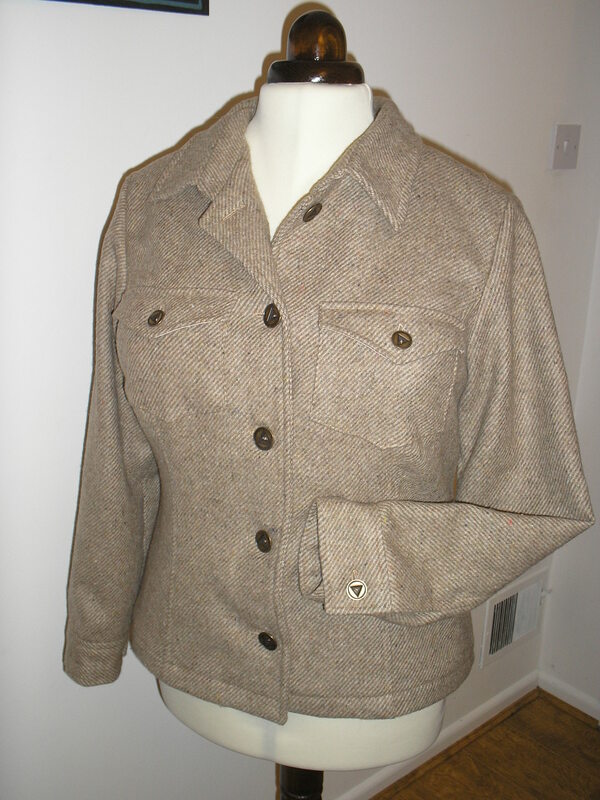 I endeavour to wear at least one me-made garment each day for the duration of May 2012′. 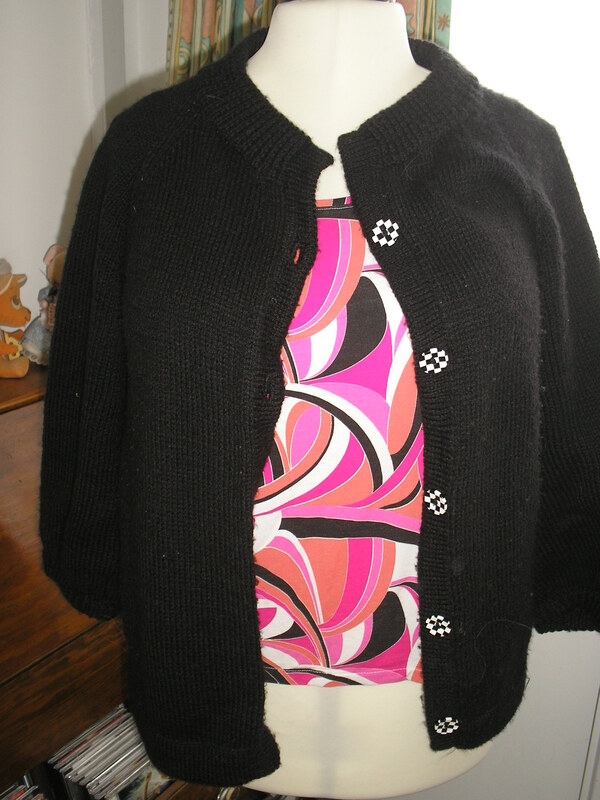 Today started well with a self sewn t-shirt and handknitted cardigan. 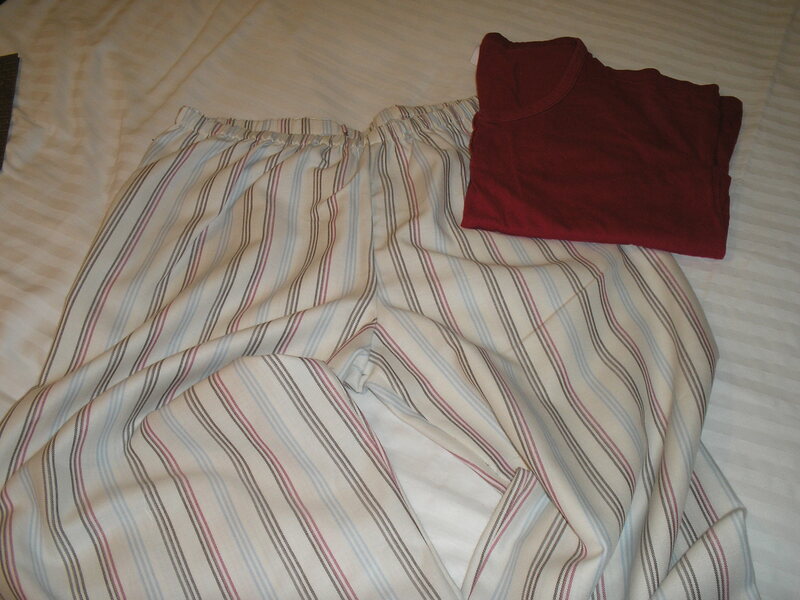 I will be wearing PJ’s I made myself when I go to bed – does that count today? Tomorrow? Both…..? Now I’m confused. I will be posting pictures once a week. Wish me luck!